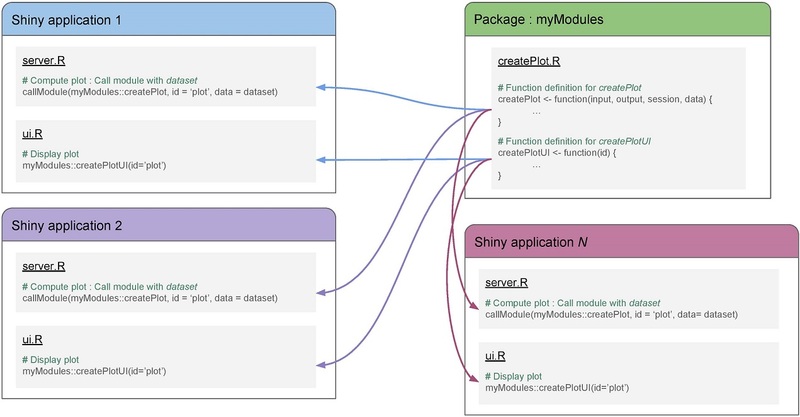 Modules are a nice help to build Shiny applications. Here are some good reasons to use them. The package flextable is existing since mid 2016 and I did not made any communication about it; obviously if I wrote it, I’d like it to be used by R users! That post is an attempt to fix that. The flextable package makes it simpler to create tables for reporting purposes. The goal of the package is to provide a set of functions that can be used to design and format tabular reporting. It’s time to announce the release of officer version 0.1.6. It allows to generate Microsoft documents from R; supported formats are Word and PowerPoint. It does come with other new packages1: flextable: produces sophisticated tables. rvg: produces vector graphics for PowerPoints mschart: produces native Microsoft charts Package officer is the reboot of ReporteRs. It’s better, faster and does only rely on R.2 Example Let’s have a demo. I am excited to announce the release of ggiraph version 0.3.3. The package did not evolved that much within the last months as I was busy on other projects. I finally found time last week to work on it. The new version fixes an issue with pan effect (that was not adjusted to the zoom level). ggiraph() has a new agument ggobj to avoid call to print in the code argument.